This portrait of a young, probably aristocratic, gentleman was painted in the first phase of Engleheart’s long career. Enrolled in the Royal Academy schools in 1769, he began his career with natural promise as an artist, and soon transferred to serve an apprenticeship alongside Sir Joshua Reynolds. Painted as early as 1775 (the earliest date in his fee book) this portrait miniature has quite remarkable impact for its size. Showing quite clearly the influence of his master, Reynolds, this tiny masterpiece in comparable in quality and composition to Reynolds oil portraits. In pose it shares similarities with Reynolds’ larger oils, such as that of Jane, Countess of Harrington painted in the same year, where she is also shown posed almost completely in profile. From 1773, Engleheart gained much patronage from his exhibits at the Royal Academy. His career advanced with great rapidity and his popularity as an artist continued throughout his life, his success eventually recognized by his appointment as miniature painter to the king (1789). A sociable, but not ostentatious character (unlike his main rival, Richard Cosway), his closest circle included artists and poets, including William Hayley, George Romney, William Blake, John Flaxman, and Jeremiah Meyer. 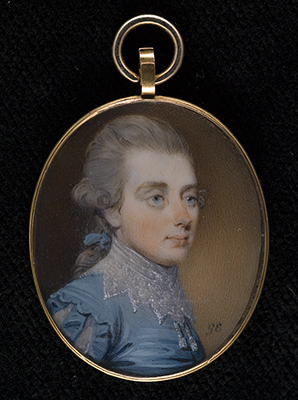 One of Engleheart's miniatures of his friend William Hayley (1809) is now in the Fitzwilliam Museum, Cambridge. In 1827 Engleheart moved to Blackheath, Kent, to live with his son Nathaniel, and he died there on 21 March 1829; he was buried in the family vault at Kew church where his gravestone can still be found.